This is important on so many levels. I've been talking about using ChemSpider as an integral part of our research for some time now and we've been steadily migrating content as new functionalities became available. We still have a lot to do to complete the process but the path is clear. The ability to upload spectra of all types (IR, H NMR, C NMR, MS, etc) in JCAMP-DX format allows for anyone with a browser to drill down to any desired expansion using JSpecView. It just makes sense to upload the NMRs of our starting materials and our fully characterized products so that we can always be just a click away from the online lab notebook when discussing our chemistry. The value of being able do substructure searching for our compounds is immense. Most organic chemistry students are not interested in learning how to run and maintain software on a lab server to keep track of their molecules. They also don't want to learn SMARTS. ChemSpider has a very familiar graphic interface for drawing molecule fragments to do substructure searching. For a free and hosted solution, the energy of activation for using ChemSpider has become very low indeed, especially for Open Notebook Science applications. As we approach 200 experiments it is becoming clear that the ability to retrieve information is just as important as doing the experiments. Systematic tagging of experiment pages with InChIKeys and InChIs is a simple way to automatically allow for direct links from ChemSpider to UsefulChem pages via Google. 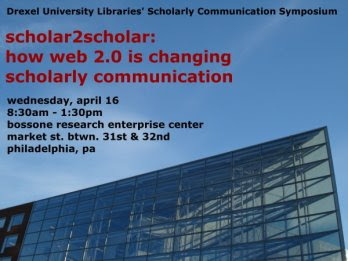 The webcast from the Scholar2Scholar conference on April 16, 2008 is now available here. The general introductions start at 15:30, my intro by Jane Bryan starts at 19:08, my talk on "Enhancing Scientific Communication through Open Notebook Science" at 23:28 and the panel at 51:40 (after several minutes of dead audio unfortunately). The panel consisted of Jean-Claude Bradley, Andre Brown, Nicole Engard, James Mitchell, Banu Onaral, Beth Ritter-Guth, and Scott Warnock. Small round-table discussions followed and were diligently documented by the library folks. Their notes will be posted here on the wiki. Overall it was a very well organized and productive event. I was impressed by the level of engagement by the participants at my round table and I expect future projects to evolve from these discussions. I especially thank Jay Bhatt and Anita Chiodo for setting the process in motion a few months ago! Seema Singh wrote a review "India Takes an Open Source Approach to Drug Discovery" which just appeared in Cell: Volume 133, Issue 2, 18 April 2008, Pages 201-203. (The doi doesn't work yet but try this link in the meantime). You'll need a subscription to view it, an increasingly familiar irony of much of the Open Science discussion these days. 1) I presented on the use of Cheminformatics in Open Notebook Science and Teaching Chemistry with Second Life. Since the ACS oral sessions are so short (15-20 mins before questions) this is a good opportunity to get our work recorded in a concise format. Speakers like to complain that they need a full hour to do justice to their elaborate projects but the shorter format seems to match the attention span of most attendees. 2) The Sci-Mix session on Monday was very hectic. I presented two posters related to my talks and helped out with the opening of the poster session on ACS island. We had 20 posters in Second Life and it was great to finally meet a few of the presenters and the organizer Kate Sellar (Finola Graves) in person. Kate was running Second Life on a large screen right at the poster entrance and giving out t-shirts. Andy Lang (Hiro Sheridan) was also helping out remotely from within Second Life. By all accounts it was well received. The posters will remain up on ACS island for the next few months and it will be possible to contact presenters via bells next to their posters. 3) I also finally met several people that I have known only virtually for some time: Rajarshi Guha, David Wild, Rich Apodaca, Noel O'Boyle and Warren DeLano. Rajarshi, Rich, Noel, Warren, Geoff Hutchison and I went out for the Blue Obelisk dinner on Tuesday night. 4) I had a good brainstorming session with Rajarshi about representing experimental workflows in XML. He suggested using Taverna to create "null" workflows - since our lab experiments are physical rather than executing code. Noel suggested using Knime. The idea is to represent experimental steps leading to a result in a standard machine readable (and thus minable) format. We're going to start very simply by limiting the workflow space to Ugi reactions. This is the principal e-Science meeting in the UK and brings together researchers from all disciplines, computer scientists and developers to meet and exchange ideas. The meeting is in its seventh year and normally attracts between 500 and 600 participants. The theme for this year's meeting is 'Crossing Boundaries: Computational Science, E-Science and Global E-Infrastructures'. The appointment of Professor Peter Coveney (UCL) as Programme Chair, heralds a new approach. This year, for the first time, key papers will be published in two back to back editions of Philosophical Transactions of the Royal Society A in the early part of 2009, with the title 'Crossing Boundaries: Computational Science, E-Science and Global E-Infrastructures'. One of the central aims of this year's meeting is to promote the domain specific applications aspects of e-Science, as well as building bridges between the three communities of the theme title. The general format of the meeting will include cross-community symposia (kicked off by invited key speakers) and workshops. The workshops are being championed by Programme Committee members in what are considered to be key areas of e-Science that need to be addressed, rather than by a call for workshops as has been done in the past. There will also be opportunities to present 20 minute talks. The WWW highlights the globally distributed nature of production and use of research data. This global nature may arise from the intrinsic nature of the data (i.e. global environmental data) or the global scope of the production (e.g. the existence of small-scale laboratory data producing data in almost all countries), or the dissemination of data collected centrally to the worldwide community (e.g. Central Facilities, LHC). The idea of ‘Follow the Data’ is one way to look at and unify the impact of e-Science, Cyber-infrastructure and the Grid on research in the Sciences, Arts and Medicine. We are particularly interested in papers that highlight and demonstrate the ways in which the data centric view provides a unifying approach to the handling and processing of information in multi- and interdisciplinary environments in ways that can satisfy the needs of small, medium and large-scale generators and consumers of data and for example the role of Web 2.0 and the “Cloud” in dealing with the topics listed. We are planning a blog/wiki/forum operation at the workshop so that the questions & discussion can be captured and 'published' along with the papers (a bit like Faraday Discussions for those who know the Royal Society Chemistry system). We should be able to do this in an efficient way making use of the fact that most people in the w/s will have a laptop open and be typing anyway! As we get more information in the table, we can start formulating new hypotheses. One of the factors that I have suspected for a while is that the products that precipitated tended to come from less concentrated solutions. Now we are starting to get results from the same Ugi reactions at different concentrations, where this effect should be more obvious. For example this compound precipitated from a 1 mmol scale reaction with 4 ml of methanol but remained in solution at a 0.25 mmol scale with 0.25 ml of methanol. This seems counterintuitive because one would expect increasing the concentration should make it easier to precipitate. But I think those solutions are so concentrated that the reagents compete as role of solvent with methanol. Rajarshi has not yet taken into account the role of concentration but we have discussed it and can more easily do so as we accumulate more results. 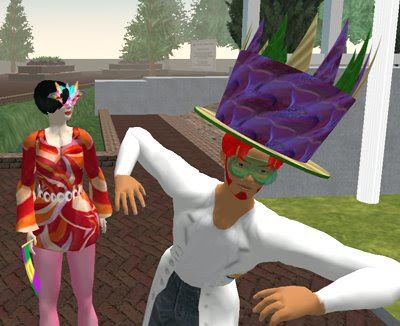 As I mentioned previously, the American Chemical Society is gearing up for a poster session in Second Life on April 7, 2008 immediately following the New Orleans ACS meeting Sci-Mix session at 20:00 EDT. There are currently 16 presenters from diverse chemical fields. In anticipation of this event there will be a little party on ACS island tonight (April 2) at 18:00 EDT. Everyone is welcome to attend. Just type "ACS" in the Second Life map search function to find the island. This experiment represents the beginning of collaboration with the UsefulChem Bradley open notebook science group of graduate and undergraduate research at Drexel University. The goal of the UsefulChem project is to use the Ugi 4 component reaction to synthesize possible anti-malarial compounds. Open notebook science allows immediate dissemination of experimental results that invites advice and suggestions as well as complementary experiments that enhance and advance the project. We are going to reproduce some of the Drexel results as well as perform two complementary reactions that have not been done at Drexel. Add 0.33 g of your aldehyde to 8 mL methanol in a 20 mL scintillation vial. Screw on a Teflon (green) cap on the vial. Vortex to mix and dissolve the aldehyde. Add 1 mL of methylamine solution to the vial. Vortex to mix. Sing the “Ugi song” while vortexing. Obtain 0.34 g of the carboxylic acid. Add the carboxylic acid to the vial. Obtain 0.39 g of tosylmethylisocyanide. Add the tosylmethylisocyanide to the vial. Take a photo of your reaction mixture. Label the vial and let the reaction mixture sit in the sealed vial. What could you do to isolate your product if after 7 days if there are no spontaneously formed crystals? Refer to UsefulChem Experiment 171 . Which reaction most closely corresponds to our experiment? What were the results? Consider the possible 1H spectrum of your Ugi product. How many aromatic Hydrogens are there? How many methyl groups are there? Where would you expect to observe the methyl groups? Consider the possible 13C spectrum of your Ugi product. How many aromatic Carbons are there? How many carbonyl carbons are there? How many methyl carbons are there? Where would you expect to observe the methyl carbons? If you were given four different compounds for each type of Ugi reactant (16 compounds in all), how many different Ugi products could you attempt to make? Safety Question: What is the safest way to transfer 1 mL of 2.0 M methamine in methanol from the stock bottle to your reaction vial? Give a reasonable explanation of your choice. Look up “tosylmethyl isocyanide” in chemspider. What is the InChI code? What is an InChI code? Since Brent and I started the discussion we have a few more precipitates involving the non-stinky tosylmethylisocyanide that may be suitable for his lab. Khalid has been doing some tedious but very necessary data checking and recording and the updated results are available on the Master Table of Ugi reactions. There are currently 65 reactions, with 20 giving precipitates - and we are now including reactions where the starting materials fail to dissolve. Not all the precipitates have been characterized but they will be over time. In fact the Ugi product that Brent is trying to make in his lab for next week has not yet been fully characterized - all those phenolic groups seem to give rise to solubility issues in CDCl3. That is a risk associated with using Open Notebook Science for a teaching lab. But it is also one that could pay off because his students could be contributing valuable results to an ongoing research project focussed on making anti-malarial compounds.